Once you get into the habit of paying off debt, it feels good. I’m not saying that writing the check feels good, but the feeling you get watching your debt numbers continuously diminish feels, well, good. It can be hard for many people to get to the point where they even think about paying off their debts, so if you’ve reached this milestone already, then congrats. The hardest part — making some changes and accepting your financial facts and what needs to be done– is over. Let the debt payoff begin! After a while, though, debt payoff can become monotonous and draining. It can be frustrating to put in so many working hours only to send that hard-earned money away to pay off a debtor (or 3). Sometimes you may feel like giving up and stopping altogether. So what should you do when your momentum slows? 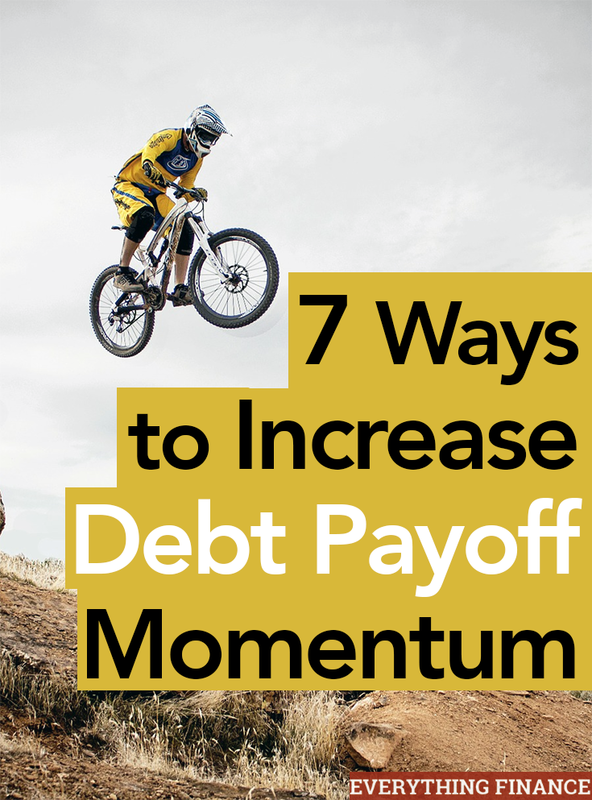 Here are 7 ways to increase your debt payoff momentum and get your motivation back. Reassess the strategy you’ve employed for your long-term debt payoff. Just because you chose it a year ago doesn’t necessarily mean it fits your situation now, especially if you’re losing steam. Although it sometimes gets a bad rap, many people love to employ Dave Ramsey’s debt snowball method in order to keep up their momentum, and it can work wonders. The snowball method encourages debtors to pay off debts with the smallest balances first so excitement builds by seeing whole debts diminish quickly. The key here is to see faster results. For instance, if you have 3 credit cards, each with $1,000, $2,000, and $3,000 balances, you would pay off the lowest balance first to create motivation. Once that debt is paid, you apply that payment to the next lowest balance, and so on. You can also manage your payments through Cloudpay. It’s a great idea in theory, and it’s helped many people succeed, but what it doesn’t take into account is the interest rate of each debt. Many people would argue that higher interest debt needs to be paid first. Although that’s a very good argument, everyone is different, so what works for you may not work for everyone. See if this method can help you gain some much-needed momentum again. A great way to save on some future interest payments is to try to get a better interest rate on your current debts. If you have credit card debt, call your credit company and tell them you’re thinking about switching over your balance to another competing company. They may offer you a better rate to get you to stay, and if they don’t, all they will tell you is “no.” It doesn’t hurt to ask! If you have mortgage or a lot of student loan debt, see if you can refinance to consolidate or get a better rate. Refinancing doesn’t make sense for everyone, but it’s worth checking into if you want to reach debt freedom faster with minimal effort. Sure, receiving a “Debt Paid in Full” notice from your lender should be reward enough after you’ve paid off a debt, but if that’s not enough, build some sort of incentive into your debt payoff plan. That doesn’t mean go out and spend tons of money on something you don’t need (which will take you further away from your goal), but give yourself something to look forward to. Maybe that means celebrating with an affordable bottle of wine or a date night with your significant other. It doesn’t have to be extravagant, it just needs to create a little incentive. Go ahead and commit now to using any extra unexpected money you receive as gifts or raises and bonuses and apply it all to your debt. If you get some money you weren’t expecting to come your way, then you didn’t already plan for it to be spent elsewhere. Apply it all to your balance as soon as you receive it to avoid the temptation of blowing it elsewhere. If it’s really killing you, take some time off. No, that doesn’t mean forever, and I of course don’t mean to stop paying your bills on time. If you need some time to regroup and gain back momentum, take a few months off by just paying the minimums, and attack that debt with gusto again when you’re ready. The important thing to remember here is not to add more to your debt. Put a date on the calendar 2 or 3 months from now and decide to start again once you reach that date, if not sooner. That’s exactly what my husband and I did when we lost some momentum on our mortgage payoff goal. We paid the regular payment for a couple of months before we were ready to go at it again, and because we’re so close to our payoff goal, I don’t regret taking a few months off as a breather. This method may not be suitable for everyone (you must have discipline), but it worked for us and helped us build up our savings again. If paying off debt doesn’t excite you for now, slow down instead and build up your savings for a bit. Once you feel better about your bank account and you have a healthy amount stashed away for emergencies, you can decide if you want to apply it all to your debt when you’re ready. Having the extra padding in your savings account might give you enough of a confidence boost to start attacking that debt again. Whatever method works for you, just remember you’ll get there eventually. Read some stories of people who have overcome their own debt hurdles, or start writing about it yourself to track your progress. Writing about it on a blog does wonders to keep you accountable and on track, but if the thought of going public scares you, just find an accountability buddy to confide in. When you finally reach the finish line, don’t forget how it felt to pay off all of that debt, and promise yourself that you’ll never get into it again. Once you’ve trudged through so much aggravation paying off your debt, your outlook will change and you’ll want to pay cash for everything (or be more responsible with your credit), and that’s a wonderful change to embrace. Have you paid off a lot of debt? Are you working towards your own debt freedom? What helped keep you motivated? All of those are pretty good tips. The only one that I kind or disagree with is #5. I’m not sure its wise for most people to take time off from paying the debt. I don’t think most people would start back. That extended break could possibly extend their debt repayment time. That’s why I say it’s not for everyone– it’s definitely not. But if you’ve, say, drained your emergency fund for an unexpected expense, then I think it’s okay to take a couple of months to build that fund back up while you pay the minimums for just a couple of months. Keeping track of your spending and budgeting is the way to go to get out of debt. You will get there!